Qualiform isn’t your only option for rubber manufacturers, but we are your best. We take pride in the work we do and the service we offer to our industry. With a combined 130 years of experience, we consider ourselves experts in the rubber manufacturing industry and we want to share that expertise with you. Our main goal has always been to meet our clients’ needs and keep them happy. We want to support their businesses in every way we can – right from the very beginning. This begins with the planning process, when we do everything we can to understand your project and your needs. Is uniformity your most important priority? Are you willing to invest more for quality materials? Are you hoping to stick to a budget? We’ll help you get the product you need no matter your goals. Choosing a rubber manufacturer can seem challenging, especially if you only understand parts of the manufacturing process. The best thing you can do is find an expert in the industry – one that understands your needs and also how to create a product that meets those needs. We are a “one stop” rubber manufacturer that can get you what you need every time. We’ll evaluate your project and determine the best way to get you what you need within your budget. Choosing a manufacturing partner should not cause stress or make your project more difficult than it needs to be. If you want to work with a company that cares as much about your project as you do, contact Qualiform. 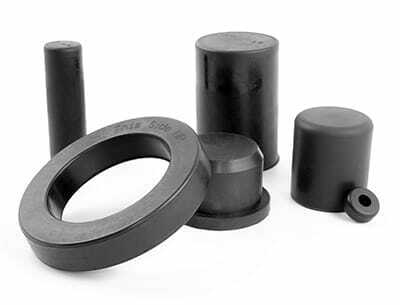 At Qualiform, our goal is to meet your needs with the highest quality rubber products available. This begins at the very beginning of every job, when we offer design advice and suggest ways for you to make manufacturing as consistent as possible, and your end product better. This ensures the final product is as high quality as you expected. When you work with Qualiform, you are in the hands of experienced and knowledgeable professionals. We don’t just want your business now, we want it for the life of your business. For more information or to discuss how we can help you with your rubber manufacturing needs, give us a call!